Drumond Park are one of our favourite games manufacturers and this one is very different! Designed for 2-4 players aged 4+ there is no board, there are no counters, no timer. Instead we have a snarling spring-loaded dinosaur and a whole nest full of baby dinosaurs that you are trying to pinch! 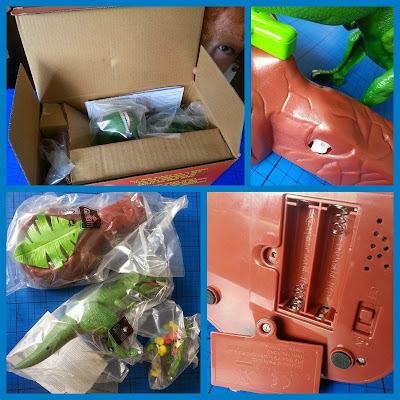 Drumond Park's Dinobite only requires 2 minutes assembly. Attach the dinosaur to the main part of the model and insert 2 x AA batteries, switch it on and you are ready to go. The batteries power the sound, which plays dinosaur style jungle noises throughout, and the timing to release the dinosaur. 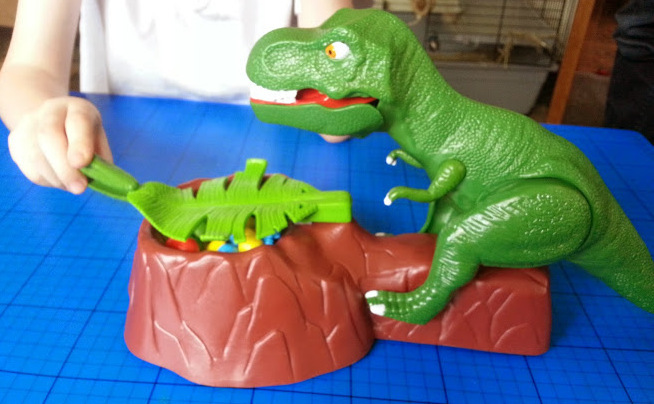 The premise of the game is that you are rescuing the little baby dinoaurs from the clutches of the dastardly T-Rex. 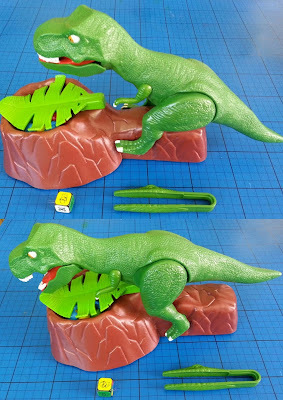 The babies are just beginning to hatch and you need to pick them up using the special dinosaur tweezers and get them to safety before you are spotted. Each baby is only rescued when you roll a matching dice on your turn, and at the end of the game the person with the most dinobabies is the winner. When the T-Rex spots you, he'll leap forward with a pretty impressive ROAR!! And no matter how many times you play, it always makes you jump! He's a pretty impressive dinosaur, and the sound effects are great. We had an issue the first time we put him together as he didn't quite line up and wouldn't leap forward enough to actually complete his big 'ROAR', but I think it was our error because it hasn't happened any time since. The dinobabies are quite tricky to pick up at first, but even our 5 year old got the hang of it very quickly. 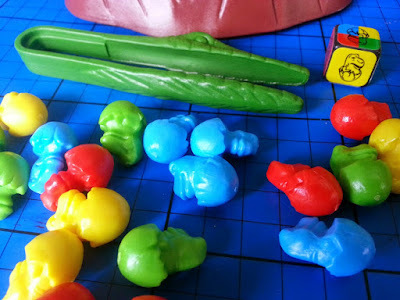 Our 6 year old colourblind son can't tell any difference between the red and green dinobabies, but it was easily fixed by allowing either for anyone who rolled red or green. This is a nice, lively game that doesn't require any reading and is very easy to play. It helps teach colours and number counting skills to small children, and is brilliant for building their fine motor skills and dexterity. It also teaches game play and turn-taking, and because it's very quick, is an excellent choice when you have younger family gamers who are joining in with you. My boys love this game, they love the peril as they anticipate the dinosaur jumping towards them. They can play it without adult supervision, and it's actually quite hard to argue over as there really isn't any confusion to be had! I like it too, it's very much like a couple of my favourite childhood games, and real genuine fun. 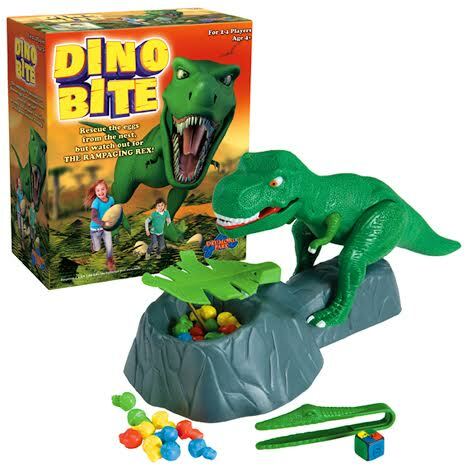 Dinobite has a recommended price of £19.99 and is available at all good toy shops or online. Drumond Park have very kindly offered a copy of Dino Bite as a prize for one of my readers. Entry is by Gleam form below. No entry is mandatory, and the giveaway will end at midnight on Sunday 5th July. UK entries only. Please see full terms and conditions at the bottom of the Gleam form. 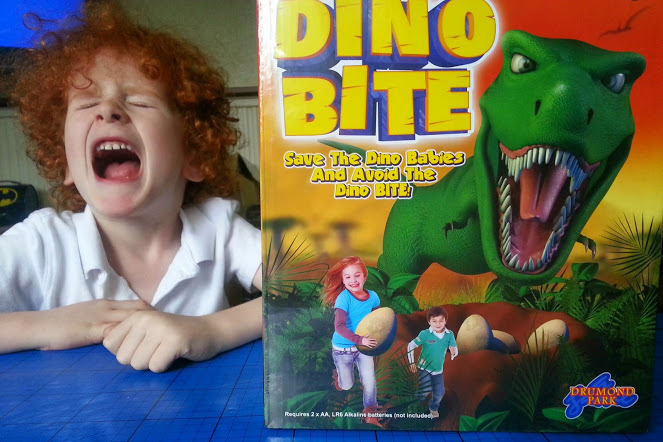 We were sent our copy of Dino Bite to review. I love a Stegosaurus, purely because of it's shape! My favourite is the Ankylosaurus! I loved the dinosaur of The Flintsones - that provided the water for their kitcken sink! I always liked a triceratops! 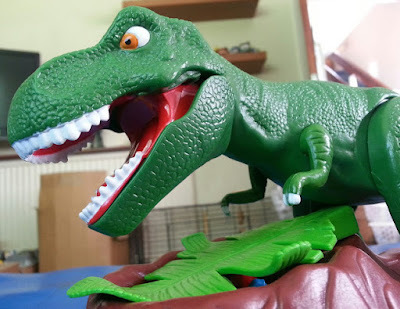 T-rex is my sons favourite - just because he is AWESOME! I like pteradactyls not sure why! Jurassic Park - all of them! T-Rex, they were so tall. Donna Loxton. Apatosaurus because it's body shape is fascinating! My son likes the T rex from The amazing world of gumball! Think her name is Tina! Gotta be a T REX! Pteradons - always been fascinated by them since i was a child. T- rex, thanks for the lovely giveaway. The big T-Rex in the first Jurassic Park! Dino ROAR!!! Doyouthinkhesawaus ! Because it makes my kids laugh out loud! Argentinosaurus is almost certainly the largest ever dinosaur and land mammal. Fascinating! The Pteranodon, love the dinosaur train cartoons so cute! The T-rex, especially when its the dinobot Grimlock!